Introducing Willy Wonka! Earlier this month we were watching Charlie and the Chocolate Factory, and it came to us, Hudson has to be Willy Wonka for Halloween. His hair is what most inspired us. I mean, look how perfect it is. 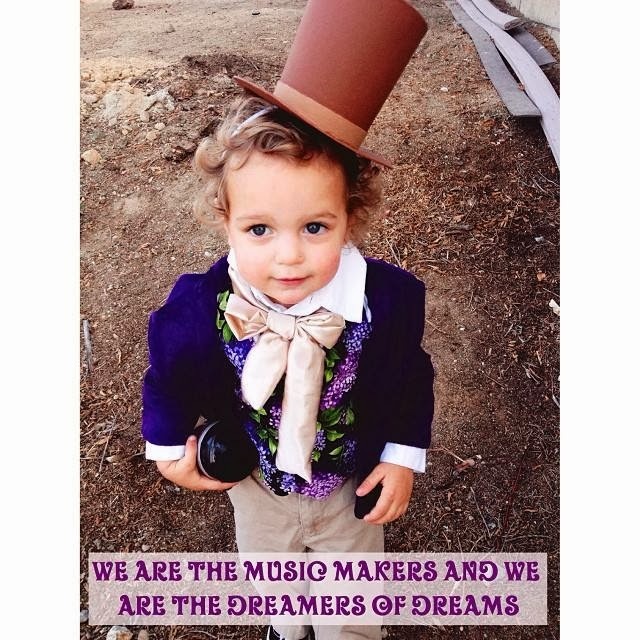 Nathan loved the idea too because Willy Wonka is one of his most favorite childhood characters. I quickly got to work planning his costume. I sewed a purple, velvety blazer, a flowery vest and a sash. We knew the hat would be the kicker for the outfit, and I was lucky to find this top hat on Etsy, and I simply painted it the colors I needed. Unfortunately, the hat didn't stay on too long before he pulled it off. I cannot be more pleased with how it turned out. We've been calling Hudson Willy all week. I love it! I wish I could sew or I would of made more costumes for my kids. absolutely adorable! You did a great job on the outfit. I would love to see him toddle from house to house as he collects his candy on Halloween in such a cute outfit. He will get alot of oooohs and aaaahs.